Thursday night at the Great American Beer Festival (Photo © 2018 Brewers Association). 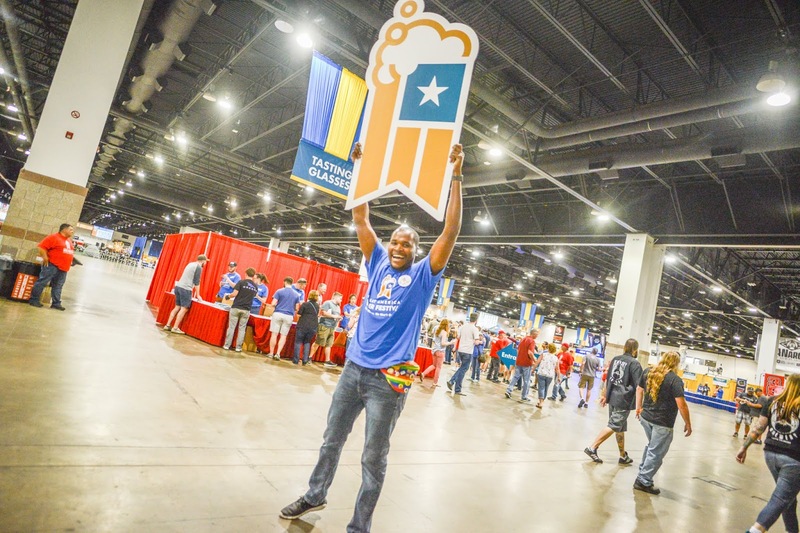 This year, the official coming of fall brought with it the conclusion of the 2018 Great American Beer Festival (GABF). 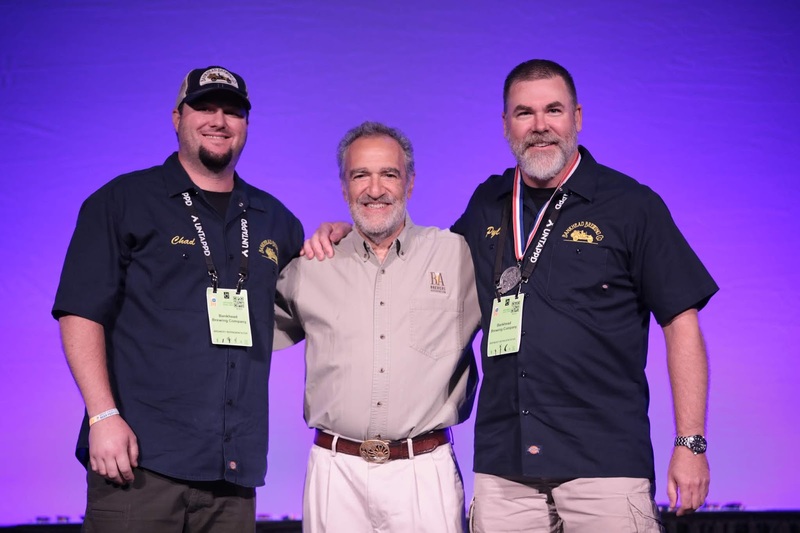 Held, as always, at the Colorado Convention Center in Denver, the competition portion of the program involved the evaluation of over 8500 beers spread across 102 different categories. In other words, many beers were consumed and many medals were awarded (306 to be exact) at this annual celebration of great American beer. A total of 18 medals found their way into the hands of brewers from the Lone Star State, with four of those going to breweries from North Texas. Locals landing on the winners list were 903 Brewers, Bankhead Brewing Co., Oak Highlands Brewery and Rahr & Sons Brewing Co. 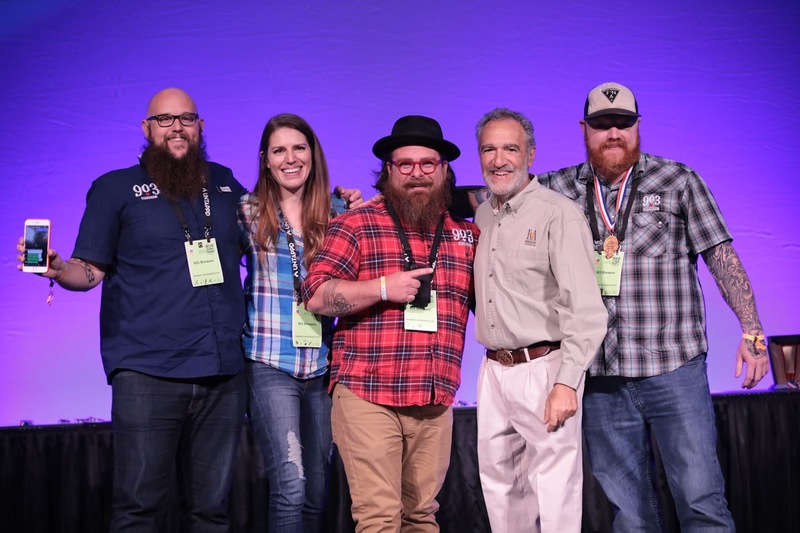 Within that group, Bankhead and Oak Highlands snagged GABF medals for the first time, while 903 Brewers scored its second overall prize. And Rahr & Sons? That brewery now has six notches on its GABF belt, with the brewery's seasonal Oktoberfest receiving accolades for the third time in four years (priors: 2015 - gold, 2017 - silver). Scotch Ale category (Photo © 2018 Brewers Association). South German-Style Hefeweizen category (Photo © 2018 Brewers Association). German-Style Maerzen category (Photo © 2018 Brewers Association). As for other notable topics from this year's event and beyond, an additional note or two on the competition is provided below, along with my usual roundup of visits to breweries in and around the Denver area. 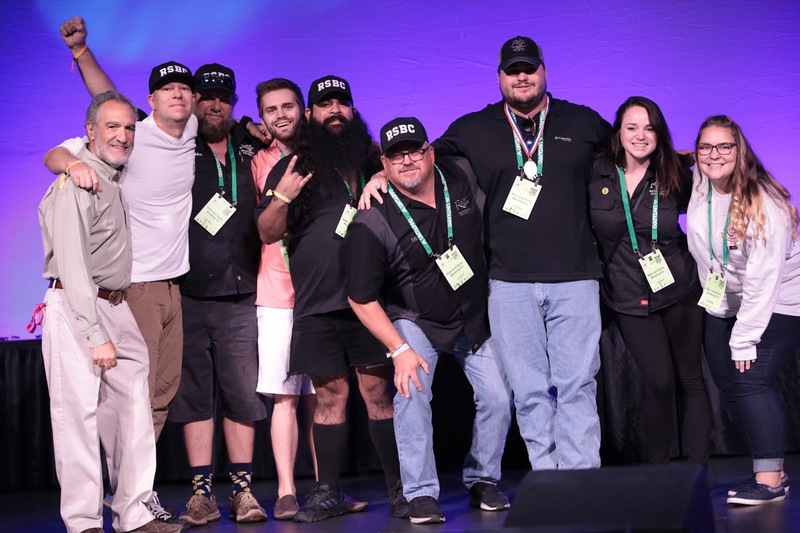 Much has been made of the seemingly meteoric rise in popularity of hazy and/or juicy IPAs, and the subject was front and center at the beginning of this year's awards ceremony. Competition Director, Chris Swersey, opened the show with the previously-revealed news that "Juicy or India Pale Ale" was the most-entered category of the competition, having knocked "American-Style India Pale Ale" from the top spot for the first time since 2002. This, Swersey suggested, was proof positive that haze isn't just a phase, and that perhaps its time for detractors to stop dissing the style. As far as I can tell, no "big" beers won a medal for the first time ever. There was no Miller, no Coors (or MillerCoors), no Anheuser Busch, and no Pabst to be found among winners in the Light Lager/Malt Liquor or Cream Ale categories. Pabst Blue Ribbon won medals in 2016 and 2017 for "American-Style Lager or Malt Liquor," but this year's honorees were all independent American brewers. One was even unsung, literally, as Unsung Brewing Co. of Tustin, Ca., nabbed a bronze for a lager called Lumino. If you're like me, and have yet to check out Austin Beer Garden Brewing Co., it might be time to put "The ABGB" at the top of your to-visit list. 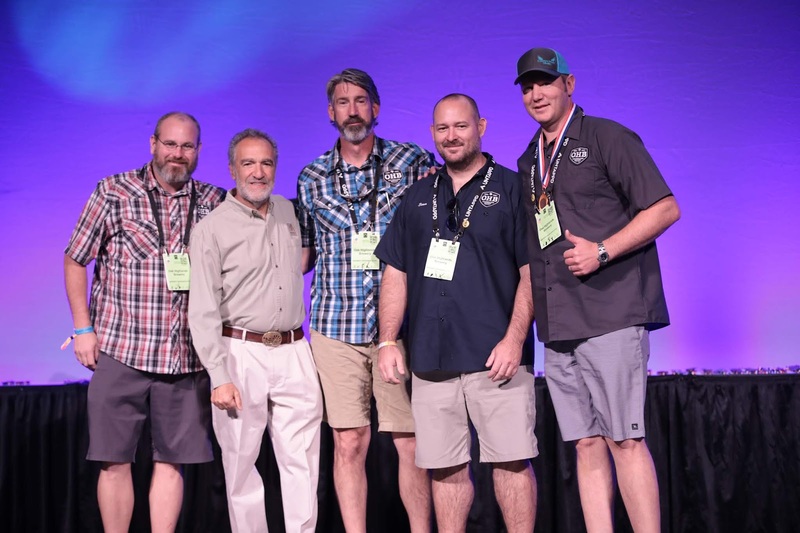 The Austin brewpub and its crew have now been named "Large Brewpub and Large Brewpub Brewer of the Year" for the third year in a row, an accomplishment that has to be among the most impressive feats ever achieved by a Texas-based brewing operation. Left: Enjoy views of Jefferson Park while sipping on brews at Briar Common. Right: Steps away from Mile High Stadium, Little Machine is the perfect place for a pregame pint. (Photos: © Brian Brown/Beer in Big D). Just north of Mile High Stadium, the Jefferson Park neighborhood in Denver is home to Briar Common Eatery + Brewery and Little Machine Beer. Briar Common is a brewpub with ten beers on tap and a full kitchen serving lunch and dinner, while Little Machine is a robot-themed brewery with great variety that sits little more than a stone's throw from the stadium parking lot. Left: WeldWerks' taproom boasts over 30 taps, with popular styles balanced by the occasional classic. Right: Custom cars and craft beer combine to create virtual man cave at Mash Lab Brewing. Many make the pilgrimage to WeldWerks Brewing in Greeley for its array of hazy IPAs, sour beers and flavorful stouts. And, while I would encourage fans of those types of beers to make the trip, I might also suggest a stop at Mash Lab Brewing in nearby Windsor. The selection is straightforward, but the beer is good and you can't beat the atmosphere, considering Mash Lab shares space with a nationally-recognized hot rod shop. Only a glass wall separates the two businesses, which means you can enjoy a beer while ogling over custom cars being crafted next door. Left: Besides being a shrine to diminutive spirits, The Grateful Gnome is a place for beer and house-made sandwiches. Right: Enter the alley behind Grateful Gnome to find the entrance to De Steeg / Blind Faith Brewing. I tend to seek out brewery clusters when traveling, and the Berkeley neighborhood in northwest Denver is a section of town that offers exactly that. Three brewing operations representing four different brands inhabit the area, with the total walking distance between them being roughly a block. The name tells the story at The Grateful Gnome Sandwich Shoppe & Brewery, a spot which exists on the same alley as the dual-branded operation, De Steeg/Blind Faith Brewing. Diversity of style is what you'll find at the Gnome and De Steeg, while Blind Faith focuses on beers brewed in the Belgian monastic tradition. Just down the way, food options are also in play at Call to Arms Brewing Co. (not pictured), thanks to Mas Kaos Pizzeria + Taqueria being located in the same building. As for the brewery's taproom, it's a vibrant and inviting space reminiscent of an old English pub. Left: Beer and books are brought together at Fiction Beer Company. Right: Dry Dock - North Dock is the brewery/taproom closest to Denver International Airport. Literary references are omnipresent at Fiction Beer Co., where bound volumes surround patrons seated in the taproom. Offerings of "liquid literature" are broken down by genre on the brewery's menu, with beers falling into the categories of Classics, Adventure and Fantasy. Located one exit east of the entrance to Denver International Aiprort, Dry Dock Brewing Co. - North Dock is the place to go for one last beer before catching a flight back home. North Dock is a secondary production facility for the Aurora-based company, with a bit of contract brewing done in house as well. Official press release from the Brewers Association, with a summary of 2018 festival statistics. Download a complete list of 2018 winners in PDF form.